A generous funding boost from Alzheimer’s WA has enabled Baptistcare to establish a recreational facility for men living with dementia in Manjimup. The money went towards building and creating a Men’s Shed at Baptistcare Moonya where men can socialise, do light handiwork or gardening and most importantly feel part of a shared experience. Baptistcare Moonya’s Lifestyle Coordinator, Suzette Starling, said the challenge has always been to find ways to help men living with dementia still feel connected to their community. “The existing Men’s Shed in Manjimup offered a space for men to meet but our residents are unable to leave Moonya without assistance, so we decided to bring a version of the Men’s Shed to us,” she said. Suzette said that Baptistcare’s philosophy of helping people to continue to live a meaningful life has created a meeting place for the community and residents to meet and mix socially. “We have already held a BBQ and an afternoon tea for our residents and local members of the Men’s Shed, and it went very well,” she said. Baptistcare Moonya’s Men’s Shed is open to residents and any interested members of the local community who might like to come along and socialise with the residents. The Alzheimer’s WA funding went towards building a shed outside the Mallee memory support unit at Baptistcare Moonya and residents now have the opportunity to look after the newly planted rose garden and do some light carpentry and painting activities. 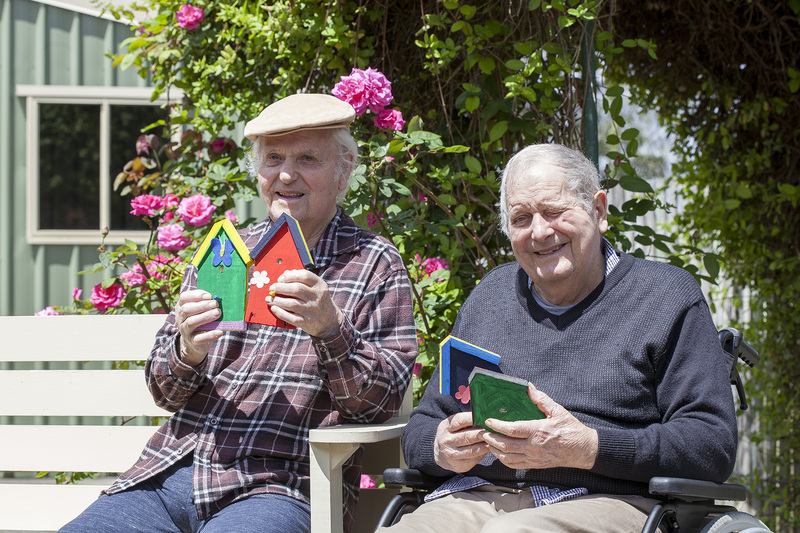 Residents, John Rowley (94) and his friend, Bob Marshall (79) have been busy tending to the roses and painting and decorating bird nesting boxes as part of the Men’s Shed activities. Much to the delight of the residents, the bird nesting boxes encourage local birdlife, including little wrens, robins and green eyes to the garden. Both men say they love being in the outdoors gardening and enjoy watching the birds come to feed. The rest of the funding was used to add a Sensory Room inside the memory support unit with an emphasis on atmosphere to help calm agitated residents and offer a tailored approach in dealing with the complications of dementia. Colour and furniture will be used to create a feeling of a home with separate and defined areas for dining, lounges and bedrooms.